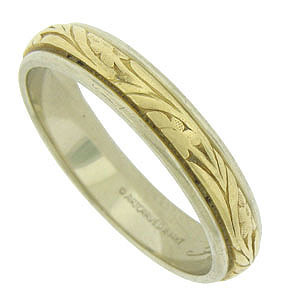 Elegant Art Deco style engraved flowers and leaves stretch across the face of this antique style bi-colored wedding band. The edges of the ring are finished in white gold, while the deeply engraved center band is yellow gold. Fashioned of 14K gold, the distinctive wedding ring measures 4.57 mm in width. Size 10 1/2. We cannot re-size.